Last year’s national elections in the Netherlands captured the attention of the world’s media. After the election of Trump in America and the British Brexit vote, the world held its breath and waited to see whether the Netherlands would be next in line to swing to populism. While outsider parties gained some ground, things swiftly went back to normal in the lowlands as a middle coalition of VVD, CDA, D66 and Christen Unie came into power. Media attention dissipated and life carried on as normal. Local elections however are far more important to the international community in the Netherlands. European expats living in the Netherlands and non-Europeans living here for five years or more can all have their say in how their city or municipality is run. With local elections coming up on Wednesday, March 21, we got in touch with Marijn Bosman to find out more. Marijn is a candidate for liberal democratic party D66 in Amsterdam, and she talked us through the issues most important to expats in this election. With responsibilities that include healthcare, housing, attracting foreign investment, arts and culture, and education, local governments in the Netherlands have considerable power over how their area is run. Expats who want to educate their children in international schools are always faced with one massive obstacle: the cost. Local government is responsible for providing school buildings in the Netherlands. “Because land prices are so high, local government has to think wisely about how to divide the space,” Marijn told us. The issue of housing is one that will be intimately familiar to any expat in the Netherlands. Demand always seems to outstrip supply in this densely populated country, and nowhere is this problem more obvious than in cities like Amsterdam. 60 per cent of housing stock in Amsterdam is designated as social housing, with the remaining 40 on the open market. Expats who can’t spend multiple years on a social housing waiting list compete with locals for a slice of the private-sector pie. “Amsterdam is a city of 180 nationalities, and we think that it should be an open city where everyone can be themselves,” said Marijn. Issues of identity were central to last year’s general election, and with the demographic makeup of the Netherlands constantly changing, many Dutch voters chose parties with a nationalist message. These issues are present at a local level too. Marijn sees the Netherlands as a place of different ethnicities, religions, and lifestyle choices living in mutual respect. Crucially to expats, Marijn also seeks to make the Netherlands attractive to international business and investment. Amsterdam is a growing city. Between 2008 and 2015, roughly 11,000 new people moved to the city every year, many of them international expats. Different parties have different ideas on how to manage that growth. Marijn thinks that business should be sustainable and fair, but her message is one that is pro-growth. With an estimated 500,000 internationals living, studying and working in the Netherlands, they make up a sizable bloc of voters. Many however may not have thought about getting involved in politics. “The best thing you can do to become part of our society is to go out and vote. 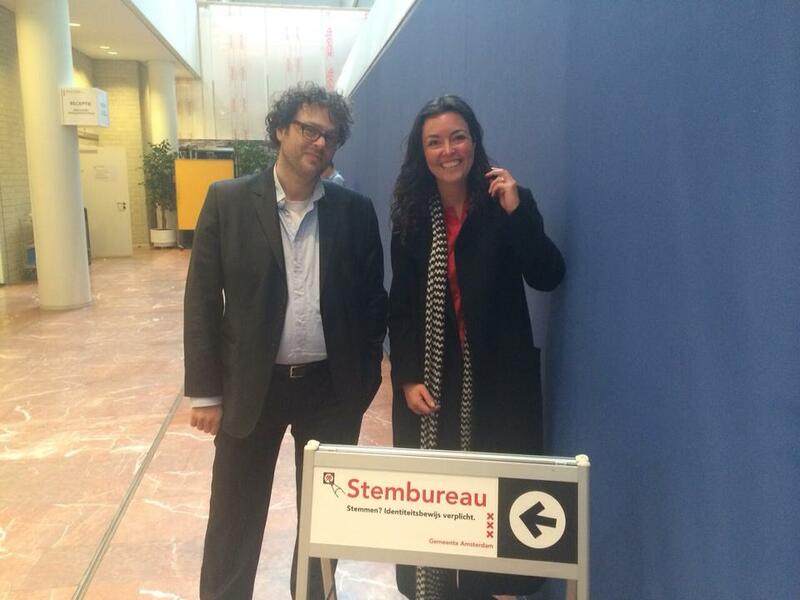 That way you think and engage yourself with our democracy,” said Marijn. “No matter what language you speak, whatever the color of your skin, or whatever religion you practice, everyone can come out and get involved in how your city is run,” Marijn concluded. 45 seats are up for grabs in Amsterdam, and thousands more across the Netherlands. Want to get out and vote? Take your “stempas” that you will have received in the mail to your polling station on March 31st and make your voice heard.